Hey there, Gameologicons, and welcome to our weekly thread for the discussion of weekend gaming plans and recent gaming glories. As you may well know, I’m making my way through Dishonored 2 for our inaugural Game In Progress review, and since we’re pulling into the final installment of that series, I’m aiming to finish up over the weekend. With that coming to a close and my copies of Pokémon Sun and Moon not scheduled to arrive until next week, I have my sights set on Owlboy this weekend. The small team at D-Pad Studio worked on this 2-D platformer for 10 years, and that dedication seems to have paid off. The game’s art is beyond sumptuous, the characters are charming and expressive, and its world is a joy to explore. While it might look more like Metroid, with its platforming and side-profile perspective, it feels more like Zelda. At least in the early goings, its dungeons and ruins are divided up into self-contained rooms where you have to solve unique little puzzles to open doors and move ahead. There’s even a triumphant jingle that plays when you complete one. 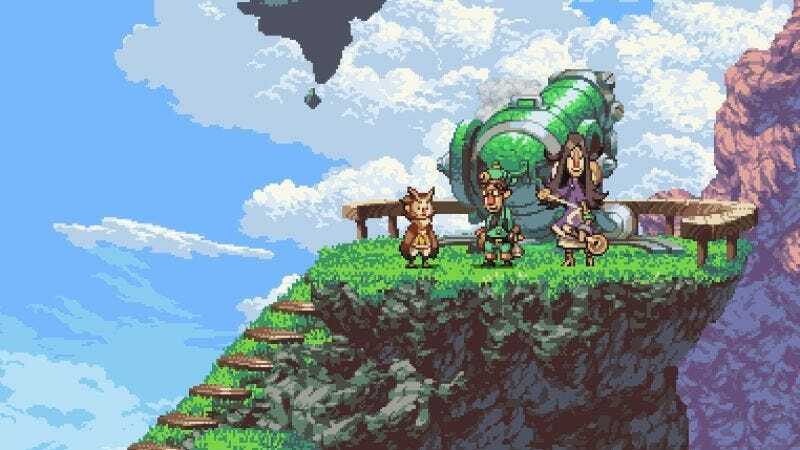 I’ve only played Owlboy for a few hours, and it’s already feeling like it might shape up to be one of my favorite games of the year. Needless to say, I can’t wait to spend more time with it.